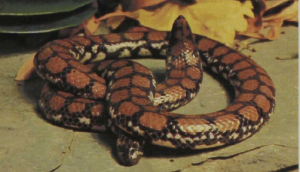 Closely related to the South American Pipe Snake is a group of some three species of snakes that occur in eastern Asia from Sri Lanka (Ceylon) to Indonesia. These are definitely burrowing animals that feed on rodents and ground reptiles, which they catch within tunnel systems. Recent studies demonstrate that their heavy and rigid jaws allow them to crush the prey as well as kill it by constriction. Consequently they show a functional analog to the feeding patterns of amphisbaenians. 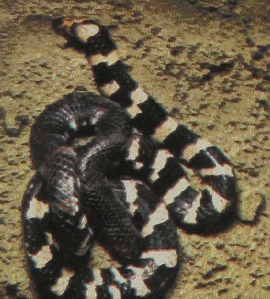 The Blotched Pipe Snake of Sri Lanka is the smallest – usually less than 20 inches long – most elegantly marked member of the group and occurs in all formerly forested parts of the island. This species may feed on limbless amphibians as does its South American relative.